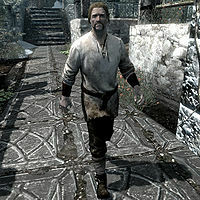 Torsten Cruel-Sea is a Nord farmer working and living in Windhelm. He owns the large farm east of the city, Hollyfrost Farm, where Tulvur works alongside his two dogs, Tiber and Ysgramor. He lives in House of Clan Cruel-Sea with his wife, Hillevi, and their son, Grimvar. Sometime before the events of Skyrim, Torsten had a daughter named Fjotli, who was brutally murdered. Her body was looted by a rival of the Thieves Guild, the Summerset Shadows, who took from her a precious family heirloom. Due to this, Torsten becomes a valuable client of the guild by requesting the destruction of the Summerset Shadows, and the return of the Cruel-Sea family locket. Torsten wears a set of miner's clothes along with a pair of boots. He carries his key to the house along with a selection of upper-class loot and gold. Tulvur: "Sir, I'm going to need some better equipment if you want me plowing the frost." Tulvur: "Well, some tools that aren't rusted through would be a start." Torsten: "I'll provide you wood and timber to make whatever riggings you'll need." Tulvur: "I'm not building a ship, sir. I'm trying to make things grow." Torsten: "Tulvur! I've just completed inspection of the farmhouse." Torsten: "It's filthy in there! Dirt everywhere, and it looks like the dogs have the run of the place." Tulvur: "Well, sir, it's a farmhouse. It's not going to be as clean as your house in the city." Torsten: "I just know that our sailors are able to keep their ship quarters clean, and I expect the same of you." Tulvur: "I'll do my best, sir." Summerset Shadows: Remove a rival guild from the picture. This page was last modified on 9 February 2018, at 17:57.